How Sally Met Infamy: Psychic Sally Morgan Caught: or was she? | "And sometimes he's so nameless"
← An Interview on the Big Announcement with ASSAP Chair Dave Wood. OK, a very quick post. I don’t know anything about stage psychic Sally Morgan, apart from having once seen her name on a poster. I looked her up on Wikipedia, and there was not much to say: she has received criticism for having lied about not previously knowing a Big Brother star she did a reading for, but replied she did it because “the director told her to”. Anyone who has ever worked in TV knows how easy it is to be inadvertently misrepresented or be set up, and how much the pressure is to comply — and how selective editing can make you look daft or dishonest. While I am as everyone probably knows by now no fan of mediumship, and automatically assume that celebrity psychics (with one strong possibility of an exception) are probably frauds or self deluding, well it’s hard to feel she was really deliberately deceiving there. Of course the SPR would probably say “caught cheating”, and break off any further investigation of her, as that was the historic rule, but I don’t think Sally Morgan is the type to step forward for controlled tests somehow. I woke up this morning to find Richard Wiseman tweeting about her being caught out; given it’s Richard, I have to obviously disagree. I am hampered by my almost total lack of knowledge of the facts of the case, but let’s face it that won’t stop anyone else having an opinion, including big name defenders of mediumship and big name sceptics. So in my obscurity I feel perfectly justified in speculating without all the facts, and Sherlock can slink off to Baker Street today and enjoy his 7% solution! The accounts are it seems pretty clear. Still ,let’s see what the Irish Independent has to say on the story! Their piece is pretty good, and well worth reading. But the plot thickens, for an explanation is herein offered for what supposedly happened. The voices were real, but of theatre techs talking? Stephen Faloon, the theatre’s general manager, last night denied anything underhand was going on and said the voice heard by the audience belonged to two ‘follow-spot operators’ working for the theatre, and not Ms Morgan. “These two guys, Stuart McKeown and Mick Skelly, are professional light technicians who were working for us, and unfortunately because a window had been left open, were heard talking. “But as soon an usherette heard them talking, and informed her supervisor, the window closed and the talking stopped. The theatre stressed it would “never be a part of any scam”, or attempt to “mislead” its audience. So says the Irish Independent. It seems entirely reasonable, the only thing I am surprised by is the naming of the two lighting techs – and I wonder if they will give statements at some point. Normally the theatre would juts say “staff members” in my experience, but the techs have been identified, the whole thing seems to be explained. Well maybe? Yet Sue and Dorrie are absolutely clear this is not what they heard – they heard a voice saying things before they were said on stage, and many others heard it too. Sue even suggests the modus operandi- plants in the foyer relating what was heard there as psychic information to sally over a radio link. Well if so, it does mean that all the people over the years who have accused Sally of Cold-Reading were wrong — she is actually Hot-Reading, using fraudulently obtained information. My first thought was that the Theatre managers account was entirely plausible – because as a sceptic I know how often human testimony can be mistaken, and the voice was a soft one we are told by Dorrie. Did they really hear two techs having a discussion, with a window simply left open cos it was so hot, and the annoyed usherette closed it gently for that reason? As the audience became concerned , if only a few words matched what was said on stage, then they could misheard and Sally be convinced of cheating — but is this what happened? The method is known, has been used, and works pretty well, as we can see. It is also after “cold reading” the most popular suggested method for how psychic stage scams work. I still have my doubts though, for exactly this reason. It is so well known, and so easy to detect, that you really would have to be pretty crap to employ it. It relies on theatres and some of their staff being potentially aware and complicit in the set up, and those people never coming forward and denouncing the whole thing as a fraud. In this internet age where pretty much anyone could post anonymously, and upload video clips and recordings of the fraud as it happened, I’m surprised it hasn’t if this method is being employed extensively as often suggested. 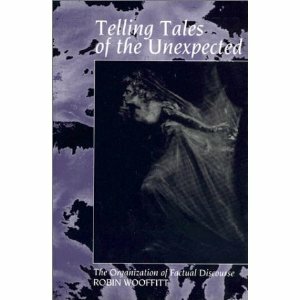 Years later I read Prof Robin Woofitt’s work on Conversation Analysis of Paranormal types, especially two books,The Language of Mediums and Psychics; the Social Organization of Everyday Miracles (2006) and Telling Tales of the Unexpected: The Organization of Factual Discourse (1992) and a couple of shorter but brilliant articles by him. Woofitt is not investigating of the paranormal claims are actually true, but how the organization of ordinary language conversation works, and in doing so I believe he shows ways in which even people who are not in nay sense remotely psychic could certainly come to believe they are, and learn linguistic methods (some similar to cold reading) that would certainly convince them and others of that. I’m not saying all psychics are fakes or deluded at all: but I certainly believe a lot are, and Woofitt has provided invaluable guidance for those interested in this area. So even celebrity psychics could genuinely believe in their gifts. If so, then how do they manage to convince an audience, with rather wooly statements? I have long offered my theory on this, and curiously enough it takes us back to something I mentioned Sally Morgan saying at the beginning of this piece. Remember she said she went along with her Director telling her to lie about not knowing the reality TV client? She complied, and tried to please. Now imagine you are in a stage show, and the camera puts your face up on the screen. You have been singled out by the medium, and agreed you may know “Godfrey” who died of eating too many pickled onions. (Actually that would convince me!) Once you have agreed you may be the person the spirit is talking to, it’s really just you and the psychic – her on stage, your ugly mug plastered all over the screen. She makes a whole series of announcements, and “facts” about your deceased love one, and you nod, say “er not quite” etc – but even if they say something totally wrong, would you call them on it? And if you do, they will say either “go home and ask about it” – suggesting further research may show they were right about the fact – or “oh, I think this is another spirit coming through” – shifting to a new client, or ” I don’t think this message is for you after all, anyone else?” Watch some stage psychics in action: they have learned, probably unconsciously, how to do this. These are all strategies for avoiding the uncomfortable fact they are wrong — and yet there is more. The audience member who is being spoken to and whose face is on the screen probably wants to believe, and has a vast emotional investment in receiving a genuine message from the deceased. There are enough people in most theatre audiences that almost all the time someone can identify with a “Dave” with a “bad back” or similar, but from here on in what is happening is a process of negotiation between the medium and you as they offer facts and you confirm or reject them. Not only have you an emotional investment, your face is on the screen – you are under immense pressure to comply, to please the believing audience. So you will probably “accept statements” even if they are questionably true, or perhaps even if you think they are false. If my hypothesis is correct, when you go outside after the performance, you may start to question some of the statements you accepted in the theatre. I am surprised that no one has in the seven years since I first proposed this idea publicly as far as I know actually tested this by conducting research: maybe they have and I have not seen it. Yet in this hypothesis, there is no need for fraud, sophisticated or simple. The whole transaction is a negotiated one; the medium still believes they are psychic, the client accepts some but not all of what they were told, and tends to remember the hits not the misses as much research has shown. Simple cold reading or the Law of Large Numbers may not be enough to explain the celebrity psychics, and Roy and Robinson have certainly thrown great doubt on it, despite my confusion over their third paper, but there are certainly good academic papers supporting paranormal cognition out there. Here I don’t see any need for fraud. I don’t know what happened with Sally Morgan on Monday night, but honestly, I think we need to be fair, critically minded, and accept that it all may be more complex than a Twitter message can convey . Perhaps she just researched local newspapers,as one might think from the final section of the RTE show, where it was noted most of the cases were of this type of “big story”; perhaps she is genuinely psychic, perhaps she is deluded, and perhaps she is dumb enough to use the Popoff technique, in which case she will be caught pretty soon. This entry was posted in Debunking myths, Paranormal, Science and tagged celebrity psychics, Conversation Analysis, fake psychics, Irish Independent, James Randi, Peter Popoff, psychics exposed, Robin Woofitt, RTE Dublin, Sally Morgan, Scepticism, Tanya Luhrmann. Bookmark the permalink. 19 Responses to How Sally Met Infamy: Psychic Sally Morgan Caught: or was she? Good post. I have a similar take, although I’m considerably less kind to Sally than you. I work at a theatre (won’t say which one, I have a great relationship with all the other senior staff there) and last year, Sally Morgan was on. It was a full house. We had our instructions as front of house staff and were left to prepare for the onslaught of the amount of people we were due to let through the doors. There was a tub in the foyer for people to leave messages or pictures of loved ones. It had to be removed and taken backstage about twenty minutes before the show begun. Well, the people came in, we got bums on seats after checking tickets and making sure people were in the right part of the theatre. I had noticed that she picked on one woman with a terminal illness who was attached to oxygen and in a wheelchair at the back of the auditorium – it was painful to watch, a real ‘lump in throat’ moment, but, after bringing myself back to reality, it dawned on me that’s how she pulls people in – finding out as these people are brought in and having them brought to everyones attention… her staff did mill around us, almost looking for info prior to the show. So to see someone disabled, look like joe public and voila! I’ve not had the opportunity this year to work in the theatre due to multiple reasons, so I’ve missed Colin Fry and I’ve also missed Tracy ‘TJ’ Higgs. However, I take everything with a pinch of salt and like it that way! The other thing is, sometimes, just sometimes, they are RIGHT. They do actually work, but when you’ve got massive sell out crowds? maybe not so… the smaller audience is by far the better structure if a medium or spirit medium wants to pass a message on from the other world. That all said and done, my kitchen clock which has never worked properly since I got it, ticked for exactly half an hour from the minute I got back from the theatre after Derek Acorahs show! And it’s not ticked again since!! What I particularly object to, is newspapers and magazines interview these con artists as if they are to be taken seriously. I believe they have to refer to their events as ‘entertainment’ these days. The situation is not helped by TV programs about ‘haunted houses’ and the like, especially as the infamous Derek Acora is still daring to show his face, having been exposed as a fraud. Funny how these people are always uneducated and never have anything remotely interesting to say about ‘the other side’. The Great Houdini exposed mediums a hundred years ago, visiting hundreds of them up and down the country, trying to contact his dead mother. He worked out exactly how they did their tricks and yet all this time later, people still want to believe this stuff and there are always unscrupulous crooks only too willing to take their money. Why would you waste precious hours of your life going to these shows? These people, as we all know, are con-artists of the most cynical and vicious sort, making fortunes out of the gullible and desperate. It is easy enough to research their methods – you or I could set ourselves up as convincing ‘psychics’ if we were lying criminals out to defraud those who don’t know or won’t accept that no-one can contact the dead. That’s because – they are DEAD and GONE! No so-called ‘psychic’ has ever revealed anything earth-shattering that they couldn’t have known. They never reveal the future or answer direct questions. They just fish for information. Look up Derren Brown’s expose of the business if you are interested in the truth. how do you know all these people are con artists?. The vast majority of psychic readers make zilch-they do it in Spiritualist Churches because they believe in it. I’ve never seen Sally Morgan although I believe she is suing the Daily Mail for libel for making the same claims. That should be a fascinating court case. I’m a sceptical believer and personally do not like those like John Edwards who cash in on their talent. However I do not find it credible that someone could plant snoopers in an audience beforehand or gain info from local newspapers. That makes no sense whatsoever. You would have to do weeks of research and be guaranteed certain persons would actually turn up on the day. What you could do, as they did in the old days, is put plants in the audience. However today you would be skating on very thin legal ice and could b charged with fraud. Someone like Sally Morgan could face bigtime jail if it were discovered she was fraudulently deluding audiences. That’s why I don’t believe the claims on radio. Doesn’t mean she is psychic, or good or bad at it or otherwise. Pat, you are clearly someone who badly WANTS to believe that psychics are genuine. Why not look honestly at the alternative view? Hear what James Randi has to say on YouTube or look at the interview between Derren Brown and Prof Dawkins on the subject. Derren explains psychics methods. Have you seen his programme where he set up a seance, doing all the typical things that Victorian ‘psychics’ did. ‘Spiritualism’ was invented in the 1820s by 3 sisters and suddenly psychics were popping up all over the place. They are all frauds! Sally Morgan was exposed long ago and yet has the sheer front to go on making money from the gullible! I saw a documentary many years ago about another infamous ‘psychic’ which exposed her methods. It seems however much evidence there is people like you are determined to believe in these frauds! It’s like a sort of religious faith. I could set myself up as a psychic tomorrow, but I’m not a greedy con artist. Remember Yuri Geller? Another one who claimed supernatural powers and was exposed – any good stage magician could do what these people do and some have explained exactly how it is done. If you have been to see Sally Morgan there is little point in trying to hold a sensible discussion! Anyone believing in such GARBAGE can never be taken seriously! You can clearly see on her tv programs, a black earpiece in her left ear and a black cable going under the left shoulder of her dress. What is that used for, answers on a post card pls lol. 2) She claims to see dead people. 3) Dead people talk to her..
What part do you think could possibly be real? I have tried to steer away from saying the people who believe such rot are also mentally unwell but what else could possibly be the answer? Psychic Sally, Derek Acorah and ALL the rest have not challenged me (yet) or taken me to court. WHY NOT? Simple. Because they ARE CON ARTIST! WHy is Sally even attending court,surely she already knows the outcome ahead of time? I’m not impressed by Sally Morgan, but I wondered which medium/psychic you thought might NOT be a fraud or self-deluding? Now then, do you think he displays confidence in her awesome ‘psychic’ powers, or that he is desperately defending his cash COW? So much for being friendly to gay people. Offering medical advice from god?